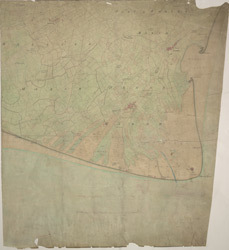 This plan of the Dungeness promontory in Kent is drawn on rectangular sheet lines and enclosed by a black border. Fields are coloured brown where cultivated, and green or blank if untilled. Stonework buildings or structures are drawn in red ink at major settlements like Lydd and New Romney. Produced against the background of the Napoleonic Wars, the drawing exhibits the concern with defence, particularly along the vulnerable coastal stretch. Numerous military batteries are documented at Abnor and along the coastline towards Romney Sands.